Mike Ullery | Daily Call City of Piqua Sanitation Dept. workers Cody Mills and Mitch Evans load 96 gal refuse containers to be distributed throughout the city, on Monday morning. City of Piqua Sanitation Dept. workers Cody Mills and Mitch Evans load 96 gal refuse containers to be distributed throughout the city, on Monday morning. 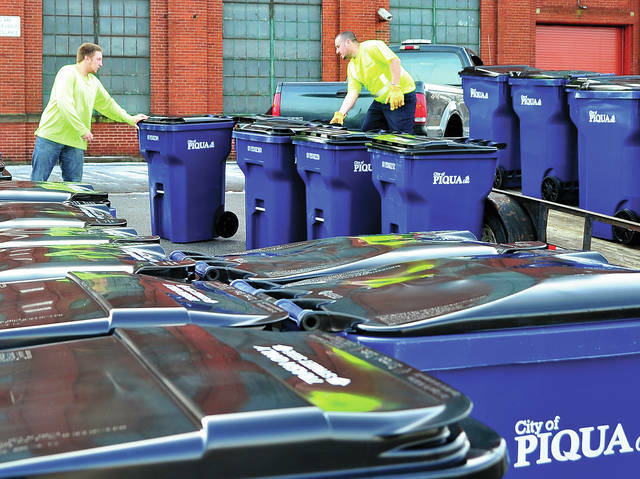 https://www.dailycall.com/wp-content/uploads/sites/30/2019/02/web1_020419mju_piqua_trashbinds.jpgMike Ullery | Daily Call City of Piqua Sanitation Dept. workers Cody Mills and Mitch Evans load 96 gal refuse containers to be distributed throughout the city, on Monday morning.